Hell they’re everywhere, even behind our mirrors! He’s a Kiwi, he’s lived here since he was a small child. He’s a famous poet; he sounds like one, he reads like one who loves language. Cheekybird stopped by at 9.50 am. Usually arrives between 9.30 & 10 am, when the early morning sparrow breakfast squadron has disappeared to go about their business. The gif doesn’t let you hear it, but she’s always very vocal. Whistles, chatters and cheeps the whole time, until I tell her she’s had enuf & close the window. I often feel like I’m on Cheekybird’s chat show. My birds have more and more blackbirds among those present. I do wish that Miss Thrush hadn’t died so young. She was very beautiful. It’s decidedly hot and muggy outside; after emptying a garden sack of lawn clippings (I stand these in the garden cart to double its capacity), reattaching a sign, spending some time wondering why the bit wasn’t working and coming in for the right one, filling the garden cart with branches and doing some weeding I am having a break. 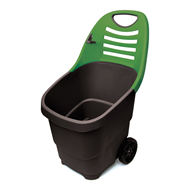 It’s a two-wheeled thing like a giant bucket that goes up at the back an has a handle/slot so that you can tow it. Mine is the smaller size green one. I put a garden sack in and attach it to the bottom of the handle hole with clips, and this more or less doubles the capacity. Ah, yes – I saw that, but from the angle shown on the first image I found I couldn’t see any wheels. Did you notice Cheekybird’s cute little seam down the front, Kitty? I wonder if she zips her feathers up? Probably. It must be nice in summer if she can undo them. Unnecessary as they all have built in fans; one on each side. 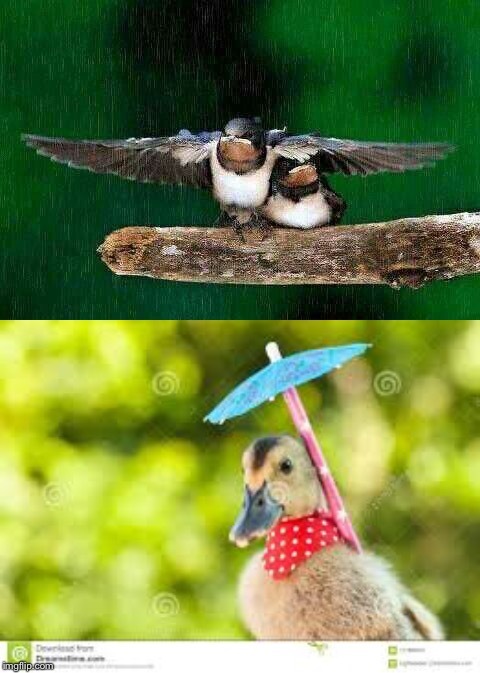 Did you ever see the bird using his wing as an umbrella to keep his little wife dry ? Do the sparrers fan themselves all night, or take turns for one to stand in front and do the whole lot ? No, I can’t say I’ve seen a bird using its wing as a brolly for another bird, although I’ve wondered if they do when their chicks hatch in the rain because the poor little things are often naked. Re keeping cool at night – I think they probably just open the windows. That’s my cart with its orange wheels. I think the orange wheels are a master stroke. No self-respecting low-life male burglar or thief will want to even think of stealing one. Har har. They are such a naff looking item anyway that the wheels can’t make them worse. The wheels make a noise that can be heard a mile away, they are wheels, not tyres.